Hello everyone, and welcome to the first of many ADP posts here. I’ll be taking a look at some early average-draft-position data for fantasy drafts in the fall, my analysis of the players in question, and how things could change between now and August. Mock drafts are some of my favorite things about things about fantasy football. During the summer, you can usually find me on Fantasy Football Calculator (where we are getting our ADP data from today) for multiple hours on end, practicing and figuring out every strategy that I could possibly use in the next few months. What’s crucial about this is to study public opinion on some of the key players that’ll be selected in 2018. What were the opinions of these players earlier in the summer? Has there been some major shakeups to the data over the past few months? Who has risen? Who has fallen? How has the draft impacted things? These questions will be answered thanks to this series, so let’s kick it off and get an initial read on things for the summer. Run-CMC had a very interesting 2017 campaign. Before the season started, many believed that McCaffrey should have been given full control of the Panthers’ backfield, instead of split-time with the aging back in Jonathan Stewart. Unfortunately, he did share a lot of time with Stewart, as McCaffrey was really only productive in the passing game, as he finished with about 650 receiving yards and 5 TD’s, compared to his 435 yards and 2 scores on the ground. While it certainly wasn’t what we were expecting out of the young player, there is a big reason why his ADP indicates that we’ll be giving him some love in drafts come fall: the departure of Jonathan Stewart. It’s obvious that McCaffrey will lead this backfield now, and will be a crucial piece in the Panthers offense. Even though the Panthers added D.J. Moore in the draft, and C.J. Anderson just recently, I still think McCaffrey is the main weapon in this offense. And I think a Top-20 pick is more than reasonable in drafts this fall. Especially in PPR leagues. Hyde is a textbook example of a player whose stock could change dramatically over the course of the next few months. The 2018 NFL draft was a big one for Hyde. Many thought that the Browns were going to take Saquon Barkley with one of their first two selections, and while they did pass on the back from Penn State, they did end up taking another running back, this time being Nick Chubb from Georgia. Now, while they didn’t spend a 1st or 4th overall pick on him, a 35th overall selection is nothing to ignore. There is certainly a lot of time that will pass before we can get a clearer look at how Chubb will look in this offense, if he even has a large workload in his first year. As for now, I will be operating under the belief that Hyde will be the primary-downs back with Duke Johnson working mostly out of the passing game. If this will be the split in 2018, I do not mind spending a 4th round pick on Hyde. However, things could change between now and Training Camp, and if Chubb will be a legitimate threat in this offense this year, then we could see Hyde’s value plummet. Thomas had a very average 2017 season, finishing the season with 949 yards, 59.3 yards/game and 5 TD’s. Obviously this had a lot to do with a lackluster offense, and a not-much-better defense, but that is sure to change in 2018. I do think that in general, this offense will do a whole lot better with Case Keenum under center. Especially now with the departure of C.J. Anderson, the combined efforts of Devontae Booker and Royce Freeman will not be enough for me to have any ounce of belief in the Broncos running game. So that leaves us with the passing game. The Broncos ended up taking SMU standout receiver Courtland Sutton at 40th overall, who should help the Broncos on offense has a whole. However, will Sutton eat into Thomas’ production and target share? While it is too early to know, it is important to keep track of any developments over the summer to see if we can get an idea about how the rookie will look in the Broncos offense this fall. 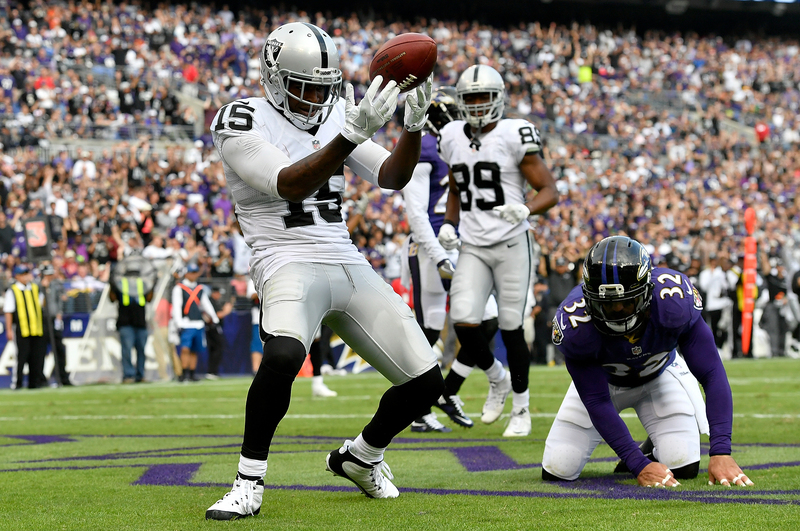 Another WR, this time who I feel even better about than Thomas, Crabtree had a change of scenery over the offseason as he now finds himself in Baltimore for 2018. As I talked about him a few weeks ago, I am very excited for this move. While Crabtree will be entering his age-30 season in 2018, he is still a very dominant receiver, and now will be taking over a receiving corps that just lost Jeremy Maclin, Mike Wallace, and Danny Woodhead out of the backfield. There is going to be a crap ton of targets available for Crabtree in this offense in 2018. However, the Ravens did get some pieces over the past few weeks to help out Flacco and Crabtree. They ended up taking Hayden Hurst, a TE from South Carolina, Mark Andrews, another TE from Oklahoma, and a pair of wideouts in the 4th and 5th rounds. Additionally, they grabbed Willie Snead as well. While I certainly don’t view any of these players as an immediate threat to Crabtree’s potential fantasy production in 2018, it certainly is a team to keep our eyes on. However, as of now, in May, I do not mind taking a 5th-round pick on him. While it still may be early to take these ADP values at face value and believe that they will be the same come August, the fact that Sterling Shepard is being drafted in the 8th round is something I will take any day of the week. Obviously, it is not a bold opinion to think the Giants’ 2018 production will be better than last season’s. However, is it crazy to think that they’ll be vastly improved, maybe even to the point that they could be considered one of the better fantasy offenses in 2018? even with an aging Eli Manning, the fact that the Giants could roll out with OBJ, Sterling Shepard, Evan Engram, and Saquon Barkley for Week 1, not to mention the new head coach in Pat Shurmur, and Nate Solder to boost the O-Line, should be music to the ears of many fantasy owners come August. Although Shepard had a disappointing sophomore year in the NFL last year thanks to some poor injuries throughout the year, there is reason to believe that he’ll have a nice bounceback year in 2018. This offense could be pretty loaded and dangerous with the addition of Barkley, enough to draw the attention away from Shepard. If he even puts up numbers close to that of his rookie year (65 receptions, 683 yards, 8 TD’s), he will absolutely smash his current value at 94th overall. Alright guys, that’s my time for today. Be sure to keep your eyes out for another episode of the Razzblitz podcast later this week, and if you haven’t, check out Matt’s fantastic interview with Matt Harmon last week! If you look at Shepard’s numbers from a total in just 11 games last year (compared to 16 games as a rookie) he came up only six catches short from his rookie year and he outproduced his receiving yards by 48 yards. Even with the drastic reduction in touchdowns (8 to 2), he placed as the number 16 WR on a PPG basis in PPR formats. @Dase: Exactly. Great point Dase!